FREE CUSTOM ENGRAVING included. Please write in the customer notes upon check out, what you would like engraved. 25-30 characters maximum. Superbly made and finished as we come to expect from BRBC. Excellent for both a thick beard and not so thick moustache. Also got my request for an engraved Icelandic saying spot on. The comb is very well built, as expected, and works wonderfully. The thicker design is really nice. Great addition to the lineup. Bought this comb as a gift for my boyfriend and he loves it! It came in beautiful packaging and the engraving was a really nice touch. We were both impressed with the quality and he now carries it with him everywhere. Thank you BRBC! I bought a beard comb for myself last year. I enjoyed it so much, I bought one for a friend for his birthday recently and had it engraved. He was very happy to get it. Thanks to Big Red Beard combs for twittering me through the process! I bought this comb for myself about a month ago and I absolutely love it. The fine side is perfect to tame the mustache and the coarse side is great for my thicker beard hair. Never a snag or catch and no static! The free engraving was an added bonus too! 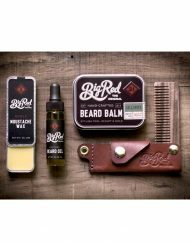 Perfect for when your beard is (unfortunately) trimmed up, or for when it’s grown out long and bushy as it well should be! Thanks BRBC! This is the 3rd no.53 I’ve bought. The first one I got in teak was a gift for myself but the second and third were gifts for my daughters two godfathers. 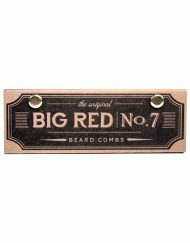 Both gentlemen are like myself avid bearders and really appreciated this great comb. 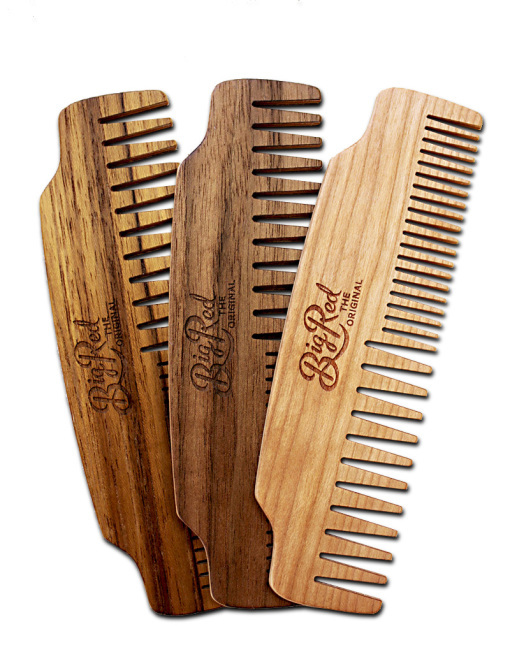 The comb alone is perfect for big beards or beginners with the wide and fine tooth sides. Then when they add free engraving how could anyone not jump at this deal?!!! Bottom line this makes a great gift for yourself or friends! Beautifully made and very functional! A pleasure to use. 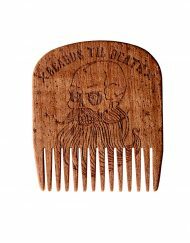 love my new beard comb! Works perfectly and awesome craftsmanship. very stylish!!! High quality. Love the engraving. 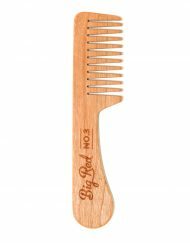 This was the first comb I’ve purchased from this site! I was really impressed with the quality I received, as was my boyfriend. We loved the free engraving! It added a personal touch to a perfect Christmas present for him. 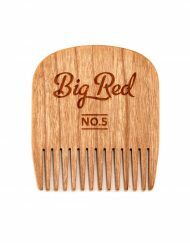 We both recommend this comb to everyone we know!! Thanks again. These guys are amazing. Their customer service is second to none. 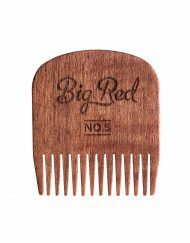 I ordered this comb for a friend over the holidays and still received emails from the team when they were meant to be shut! 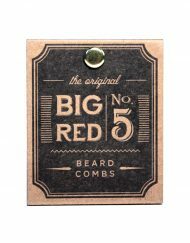 I’ll be getting myself a treat soon enough from big red beard combs and can’t wait to do business with them again. Love you guys and live long the beard!!! 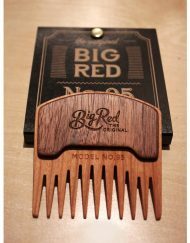 The high quality and functionality of this comb made it the perfect gift for my boyfriend and his beard !! And the free personalized engraving was the icing on the cake !!! 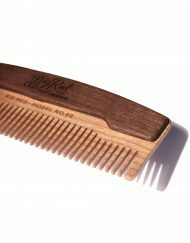 I have been looking for quality North American-made wood combs for the past two years. Overwhelmingly the products available on big online retailers (like the one that rhymes with Shmamazon) are made overseas in China or other Asian countries where quality, and more importantly, working conditions, are very suspect. 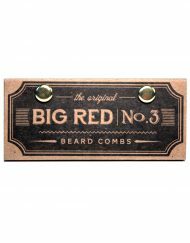 Big Red Beard Combs finally met my requirements of locally-made, high quality design. You have to buy one for the packaging alone! Now on to function… I have a naturally very curly, thick, somewhat wiry beard. Yes, it drives me insane. Keeping a morning ritual of oiling and combing my beard has significantly approved its appearance and health. The wide-toothed side allows for general detangling while the fine-toothed side finishes my moustache. I also use the fine-toothed side at the top of my cheeks to give the illusion that my beard actually wants to lay down straight before turning into a mossy mess at my jawline. All in all, I would highly recommend this product for any of your bearded loved ones. I have been using garbage combs and brushes for years. Then I joined the military and now I am retired and I’m so glad I now have something work five stars to use on my beard. This has both sizes and I even got I engraved with my business name on it. I use it every day and I never leave the house without it! great product. works great. looks great. my daughter actually loves it so much I had to give it to her. she always wants to tub and wash her hair now so I can comb it with my custom engraved “lunchbox” NO.53. love this product. Got this for my boyfriend for Valentines day. It was his first beard comb. He loves it! He keeps it with him all the time! I guess I will have to get a pocket comb for him soon. Fantastically crafted comb and so happy with the custom engraving. Perfectly mixed comb for short to long beards, also the ‘stache and hair. A must-have for your daily styling and grooming. Got this comb for my boyfriend and he absolutely loves it . Really nice and a nice touch to have it personally engraved . Thanks a bunch, next were going to try the oil ! 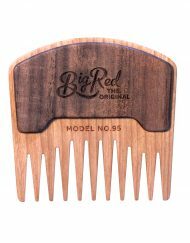 Get this comb if you want the most versatile comb ever made. It detangles/it straightens/ it styles. Great for slick back looks and facial hair of every length. The Teak wood looks like tigerstripes. Beautiful. 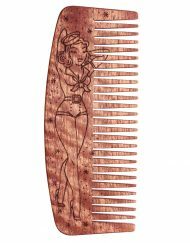 I ordered this comb with some custom engraving as an anniversary gift for my husband. It arrived in less than a week and looks amazing! 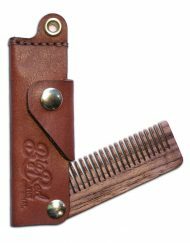 This will be his first beard comb. I can’t wait to give it to him and I only hope he wants to order more. I am so pleased with this gift! It was exactly what I was looking for! Great quality and beautiful teak wood! I will also add the customer service was amazing! I will totally purchase again and recommend to all! I offered this comb to my boyfriend for his birthday and he was really pleased with it! Oddly enough, his first comment was that he loved the smell. He also loved that it had his name engraved, it made it even more special and unique. He really feels like a sir 😉 thanks a million! I bought this comb a while back as a present for my boyfriend and he absolutely loves it, I’ve never seen him comb his beard this much! 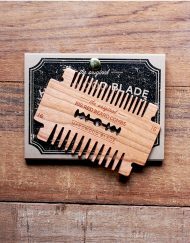 Not only is the comb made well, the customer service is also absolutely amazing. I couldn’t figure out where to put the phrase I wanted engraved on the comb, within minutes of sending the question I got an immediate response. You guys are doing great!! Wide and fine tooth in a nice combo comb! 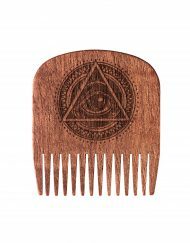 The quality of this comb is amazing. You guys really do quality work. I really liked the fact that you go the extra length to make sure the comb is packaged so nicely for shipping. 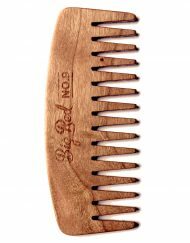 By far the best comb I own. I started with the no.7 with my baby beard and now that it’s longer the wide and narrow teeth help both beard and mustache! The custom engraving is absolutely awesome! This was the perfect gift for my boyfriend. 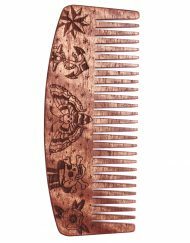 Previously he had used a metal comb which he said snagged his beard and would break hairs. It’s light enough for him to carry in his pocket but still durable. Plus the free engraving adds that little bit of personalization that makes it even more special. Got this for a Christmas gift. Pleasantly surprised how GOOD it feels to comb my beard. No snags. Just nice. 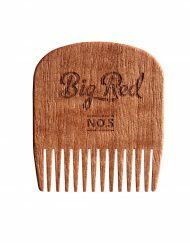 Big ups on this combs!!! I love how smooth my comb is. The wood helps prevent static which is extremely key. 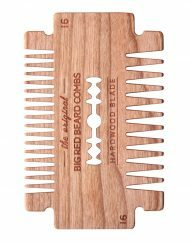 Hands down the best beard comb I’ve ever used. 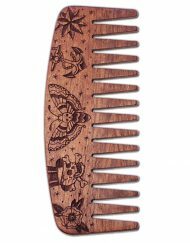 I ordered this comb for my boyfriend for Christmas/his birthday since they’re two days apart, and was surprised that it shipped so quickly! I thought “there’s no way they could have engraved it and shipped it practically overnight!” but they did! He loves the comb! He sits in bed reading at night, absent-mindedly combing his beard over and over again. The only thing that would make it perfect would be a built-in tracking device! Since he uses it in every part of the house, he also loses it in every part of the house. This was definitely a worthwhile purchase and I’ve earned my spot as girlfriend of the year (even if I didn’t have any competition to begin with). 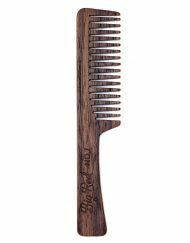 I received this comb in the Teak style for my birthday and it feels nice in the hand and though cliche it may be, it literally glides through my beard. The smaller teeth catch some of my more stubborn strands but it feels sooo nice and smooth when I comb. The custom engraving was wonderful too. Amazing! 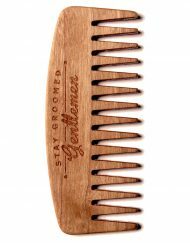 Loved these beard combs, bought two for Father’s Day. They were really appreciated especially the engraving. Would 100% recommend! Love this comb!! Got it for my husband for our 5th wedding anniversary, it’s such a great personalized item. I would HIGHLY recommend getting shipping with tracking if you are in the US – I got regular shipping (without tracking) and it was a bit nervewracking as it took much longer (3.5 weeks) to arrive due to the holidays and customs. I bought this comb as a Christmas present for my boyfriend and I had his name engraved into it and he loves it way more than all of his other combs! Absolutely impresses with this comb. My boyfriend loved it, and it’s solid packaging it came in. We are both very satisfied with the products quality, and the businesses efficiency. Thank you! Comb came out exceptionally well, the engraving on the wood i choose (teak) could have been a little darker, but what the guys did I am impressed. Very FAST and Friendly service. I had this comb custom engraved for my nephew. There was a question about the engraving and customer service was very prompt asking and answering. When I received I was very impressed with the way it was packaged and presented. 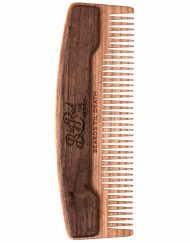 This looks like a very well made comb and I must say I am a bit jealous of my nephew….It may be time to order my own! !